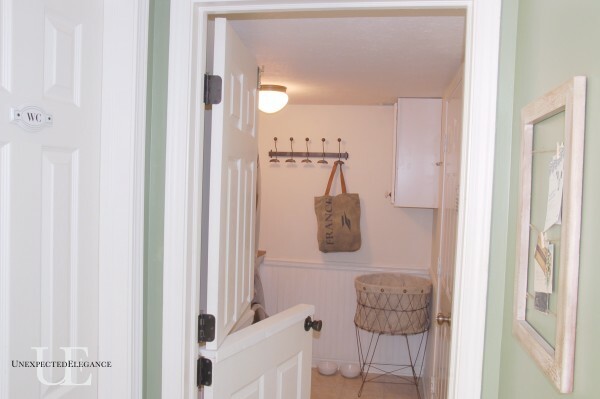 For the Pinterest challenge I had shown you my laundry room door that I made into a split door. And today, I’m going to show you how we made it. My parents were visiting, so my Dad did most of the construction for this project. 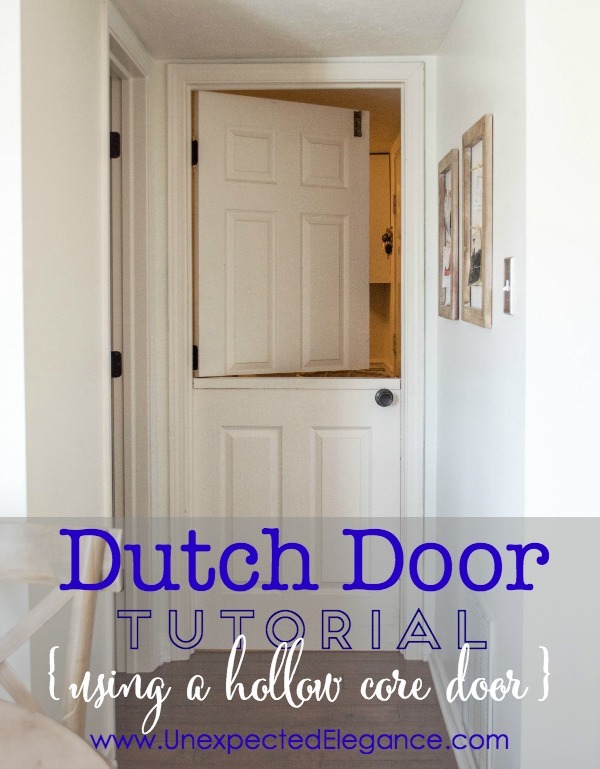 Here’s our dutch door tutorial using a hollow core door! We started with a the standard, builder, hollow core door. We decided where we wanted to cut the door (slightly above the handle) and made sure that after we gave the allowance for the ledge, we wouldn’t cut into the door panels. This cut will be a matter of preference, but make sure you account for the extra ledge measurement. Tip: To make a straight cut without a table saw, use a straight board as a guide. 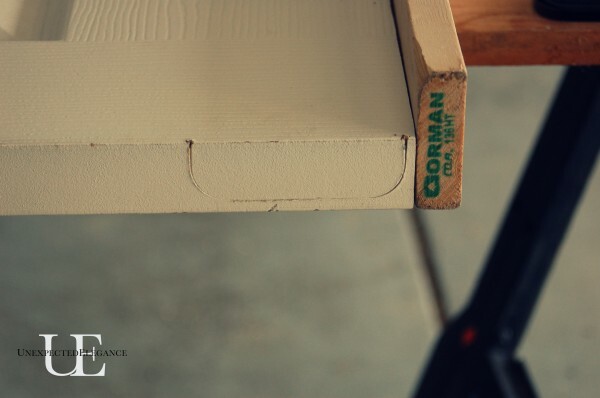 We used a 1×2″ popular board for the ledge, so we marked that with an 1/8″ clearance above the first cut. 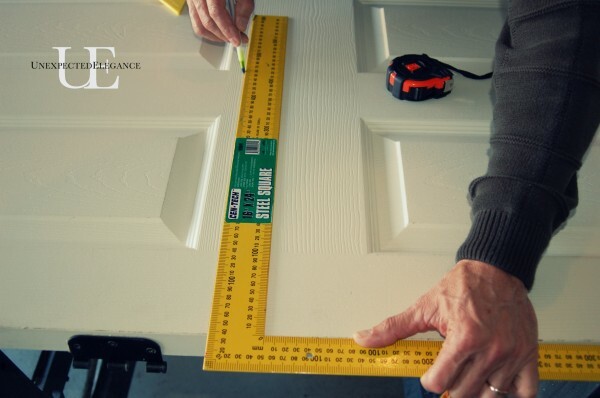 Tip: A 1×2 is actually 3/4″ x 1 1/2″. Anna White has a great resource to help you with these measurements here. 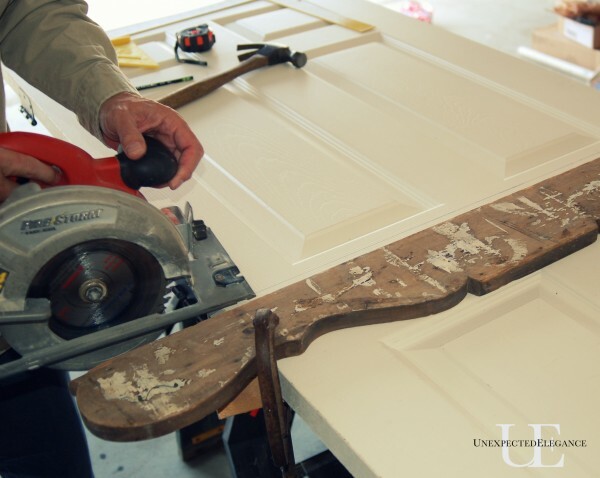 It’s also helpful to keep the door supported with some scrap wood as you cut. 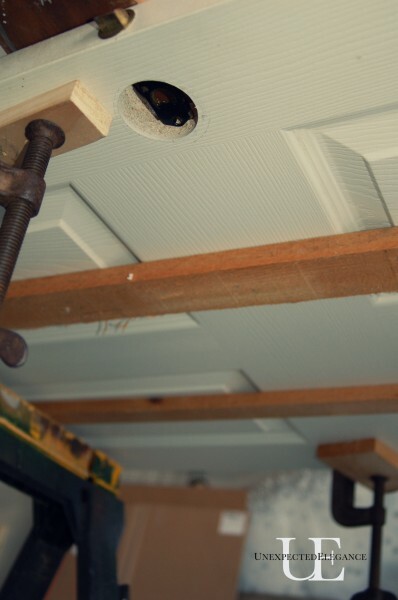 It will keep the hollow core door from splintering if it happens to fall the slightest. Just cut a little then move the boards as you go OR set your blade to where it will cut through the door but not completely through the supports. To make the ledge we cut down a 2×2 piece of scrap to fit into the center of the door and screwed it to the underside of the 1×2. This fits snugly into the door without having to secure it. You just hit it with a hammer and it leaves a mark, like the one below. Then you can chisel it out. The “wood” is so soft, you can even use a flat head screwdriver to chisel it out. To hang it, attach the hinge to the top of the door. 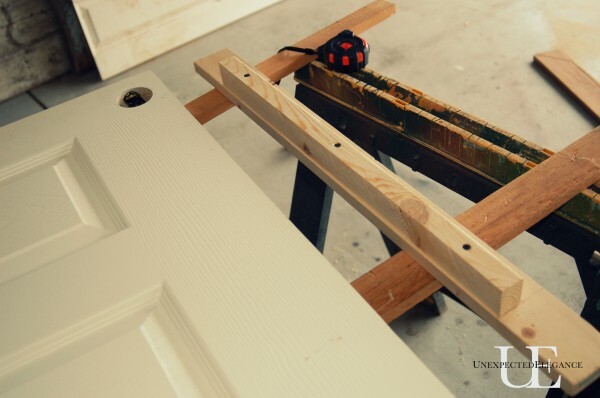 Put the hinge and pin in place on the bottom of the door (this will line it up for you) and then attach the top hinge to the door frame using wood screws. We added a little piece of trim under the ledge, but you don’t have to. Lastly, we added a locking mechanism on the back to keep the top and bottom together when I want the door completely closed. Now I just need to be patient! We plan on getting a new washer and dryer some time this year, then the whole (meaning very small) laundry room will finish getting it’s makeover! Here’s the finished laundry room!!! To see the whole thing, click here. « Let’s Go Activities GIVEAWAY!! LOVE your split door. My in-laws had one years ago and I always thought it was so cool. Thanks, Vanessa. 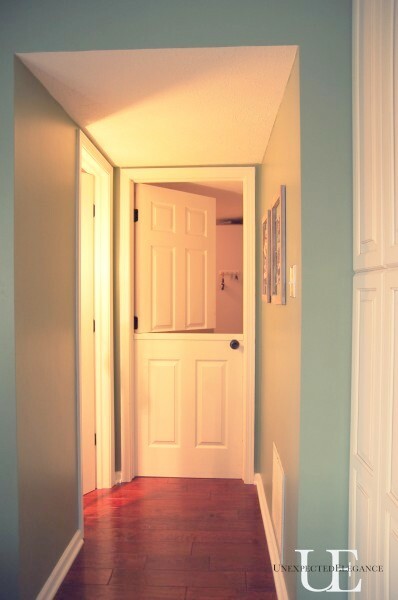 I love split doors and really wanted to get one for the front door…hubs vetoed that one! Great tutorial! 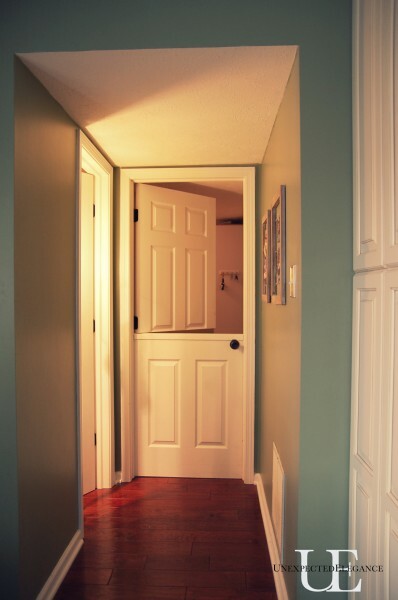 I want a Dutch Door for keeping our dogs in the bedroom when we have friends over who don’t want a dachshund in their lap! 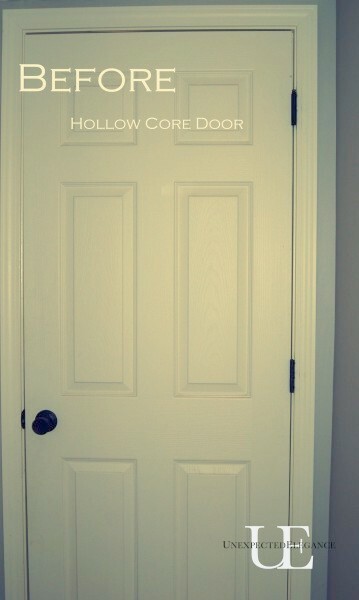 I was afraid I’d need to replace our hollow core door with a solid wood door; I’m so happy to see that’s not necessary! I LOVE this project! 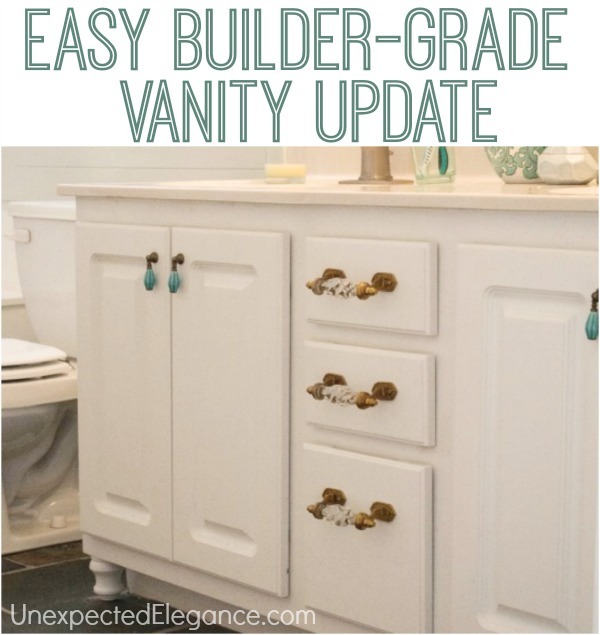 I saw it over on Hometalk and we are going to work on it this weekend! Thank you for this. I have been looking for a way to build a half door because I don’t want to pay $400 in the store. Great! Hope it works out fairly easily! Let me know how it comes out! 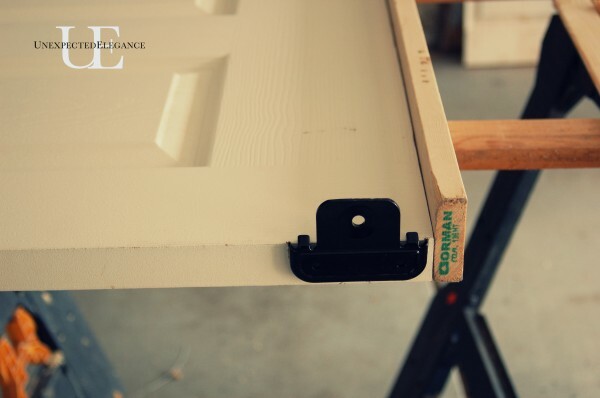 Also if you’re super cheap, just trace your hinge on the door using a pencil, then use your chisel and go around the line using the chisel like a punch and outline the hinge first then chisel out the recess. This is gorgeous! And a great tutorial. I am an infant and toddler teacher, and I am doing this to my classroom door this weekend! My question is.. What did you do to the bottom of the top part of the door? Did you fill it with wood like the top of the bottom half before you added the ledge? Ginny, I left the top open but my intention was to add a piece of wood. Hi! 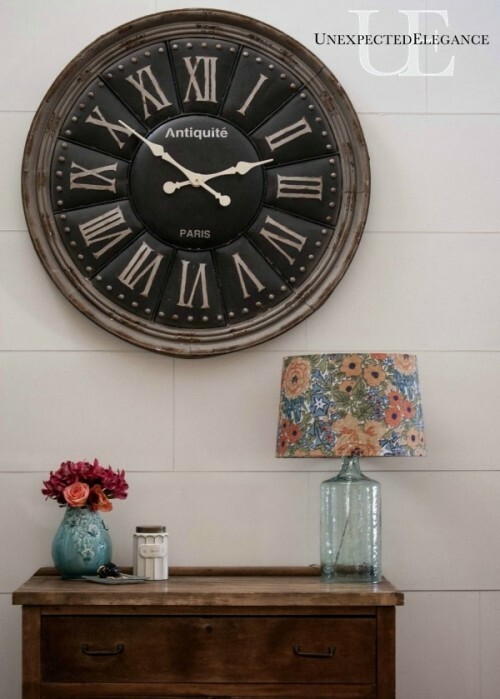 I love this idea…I’m moderately handy, so I was going to attempt to do this myself – what I’m not understanding though (and maybe I missed it somewhere), but how is there room to add the shelf board in the middle and still have the door close? 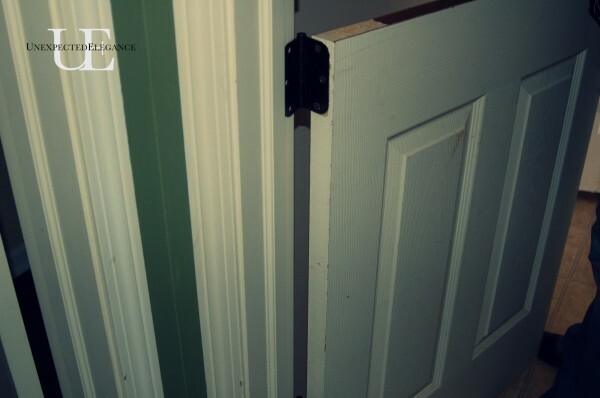 Do you cut the door twice so that there is an extra inch gap? I am not understanding how the ledge is accounted for . You cut the door in half and then cut another piece off to acct for the height of the ledge ? Also what was done to the top part of the door ? No finish ? No closing off of the hollow part of the door ? Hi! Great looking door! Did you have to plug the top half of the door? (The bottom of it)? Nice Job. Simple and practical. I like it! Just did one according to your page. Love it! Thank you so much! YAY!! So glad it was helpful!